Adopt-a-Pet.com and Bayer Animal Health, the creator of K9 Advantix II, partner to launch “Pooch Protest” to raise awareness of the dangers of fleas and ticks. Many animals that unfortunately end up in shelters transmit or easily catch disease-causing parasites. Pooch Protest is a viral campaign and every pet owner that registers their dog or cat online, a tube of K9 Advantix II to Adopt-a-Pet.com to be dispersed to animal shelters and rescue centers. In addition to its national online presence, the “Pooch Protest” campaign is featured on billboards which will begin in Charlotte, North Carolina, and then roll out to Raleigh/Durham, North Carolina, and Philadelphia, Pennsylvania. K9 Advantix® II is for use on dogs only. 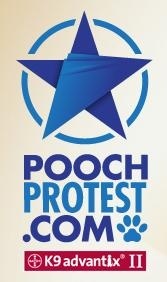 For more information, visit www.PoochProtest.com.